Swinging Indoor is something you need to get used to. Holding back not swinging freely like you do outdoor will have an effect on the distances. Make sure the overhead lights are at least 50w and are 24 degrees flood lights. These lights will produce a crystal clear black shadow of the club and ball. The picture above shows a fuzzy grey shadow. Double or even tripple shadow projections will cause incorrect results. The picture above shows a clear single black shadow of the golf club. Make sure the 2 light circles on the floor do not cross eachother. The front light should not shine on the ball track sensors (row of sensors in front of the ball). Make sure the Vertical Camera picks up the launch angle perfectly. Test this in the Camera Preview section of the interface. An incorrect launch angle will have an immediate effect on the yardages. The ball must always be played from the white tee spot position. Playing from any other position will give inconsequent results. The picture above shows an incorrect playing position. The ball will launch, but the club face angle and ball speed measurements will be off. The picture above shows the correct playing position. The picture above shows the correct playing position when teeing up. When playing with special golf balls, like foam balls, hollow practice balls or range balls, the distance the golf ball travels must be adjusted to override the standard golf ball physics used by the simulator software. 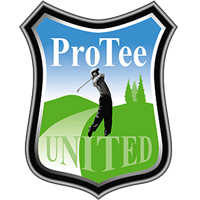 Change the Ball Launch Increase factor in the ProTee Golf Interface to a higher value (default = 1). A value like 1.1 will increase the ball speed with 10%. A value like 1.2 will increase the ball speed with 20% which results into more carry. This setting can be found on the Settings page.